Twenty (20) liters of biodegradable cleaning product leaked from Suncor Energy plant into the St. Clair River Tuesday. This is the second Chemical Valley spill within a month. Both spills shut down local water intakes, stated the Mayor of Sarnia. Suncor spokeswoman, Jennifer Johnson, stated that company officials recognized “a small quantity of soapy-looking material at the refinery’s outlet to the St. Clair River”. She continued, “Due to the small volume of material released over that timefram, it’s not expected that the soap will have reached a level of concern…the discovery may be related to equipment cleaning ahead of the refinery’s planned turnaround”. There are plans in place to shut down parts of the plant for a month for planned maintenance work. Hazardous materials storage containers provide compliant protection for hazardous materials containment. Compliant containment practices are very important when using hazardous materials in manufacturing operations. Sarnias Mayor, Bradley, stated the spill is a big disappointment. He also stated, “It’s such a setback for us because we’ve come so far in the industry and with the city removing ourselves from the river and the possibilities of spills…when it does happen and we have to two water intake shutdowns that is just not acceptable”. Hazardous materials storage lockers helps provide a completely sealed, and fully compliant container when storing hazardous liquids and flammable liquids. Fully compliant and made in the USA, hazardous materials storage lockers from US Chemical Storage provides safe, secure and reliable storage solutions for solid and liquid hazmat. Keep your hazardous materials closer to your facility with a hazmat container to increase your operational productivity. Featured with a built-in sump containment for complete compliance and ultimate safety. All of our hazardous materials storage lockers feature a chemical and weather resistant epoxy paint to ensure your hazardous material is protected from extreme weathering conditions. Made from heavy-duty, 12-gauge steel for maximum strength and superior reliability. Choose from our fire rated or non-fire rated buildings to compliantly store your flammables or non-flammables compliantly. 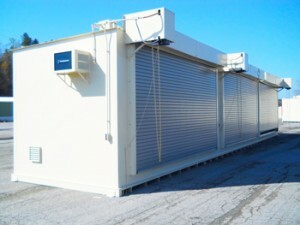 All of our hazardous materials storage buildings are 100% customizable, in order to meet your exact specific requirements. Call one of our sales engineers to find out how you can get compliant today!